Some days the stress is so bad that I just want to curl up and crawl under a rock and pretend like life isn't going on around me. Homeschooling four children with special needs keeps me going 24 hours a day. One of the kids is always having an issue. Very little time each day doesn't include some sort of drama....and yes even during the night. Needless to say I don't think I have had a full night's sleep in over 16 years. Lack of sleep makes the days even harder most times. Recently I was letting myself get so overwhelmed, and trust me it's easy to do. I was crawling into a pity hole. Joe has been traveling a lot and that leaves all childc and household responsibilities on me. I couldn't just go and and take a walk, or shop on my own. So I had to start getting creative. Here are a few of the things I do to help control a little of the stress....it doesn't take it all away, but it helps. Exercise helps to lessen the damage of stress in your life. You don't need to do a full cardio workout. A simple walk can help immensely. Well how do I do that being the lone adult home? I wake up early and walk/jog on the treadmill. Our treadmill is in a separate room from our living room. I can hide out on the treadmill, leaving the storage room door open in case a child wakes up and needs something. I really test myself and force myself out of my comfort zone. I do this for a minimum of 30 minutes. If I can't seem to do that for some reason, I watch the weather and plan a bike ride with the kids. I either jog alongside them or ride my bike. Even though I am with the kids, I am still getting that exercise that really helps out. I do feel better at the end of a good workout. Another way I will sneak exercise in (and call me a bad mom) but I will walk/jog in the side street next to our house. I wait until the kids are all happy and occupied, mainly the boys, and the girls will come out to ride their bikes or scooters while I walk/jog the same pattern over and over for 30 minutes. Yeah, it's not great walking the same pattern up to 10 times, but I am out and getting sunshine. Did I mention how great sunshine is for helping with stress and beating depression? As if my days aren't long enough, it helps me to get up at least an hour before I expect the first child to awaken. This is the time that I can read my Bible, run billing, return emails that require concentration or even do studying for my homework. If I can get the important stuff done first thing, that helps me throughout the day. I also double check my to-do list before I start waking up the kids. I make my plan of attack for field trips, experiments or projects that are going to be tackled that day. I still check email throughout the day, unless we are not home, but I can get a jump on things. Sometimes I do exercise also, so I leave myself up to an hour and a half in the early am to get started. I also plan what I will be doing during these times. One day might be bill paying, another might be extra Bible study, another might be uploading classes to our Homeschool with Minecraft server, or some days it literally is all office work. But that extra 1 - 2 hours in the am really helps me know that I am able to get some things done. It also leaves me feeling less guilty about taking that 45 minutes of exercise each day that I need. Eating junk food is so easy to do.....but stop it. Watching your diet and eating healthy foods/snacks is imperative. Junk food can cause brain fog and leave you feeling more drained than you are already feeling. Stress takes a toll on your body. You need to replenish the nutrients that are being eaten constantly as your body continues the fight. Junk food doesn't provide any of those vitamins and minerals you need. Find a way to stay out of those bad for your snacks. Find healthy alterantives such as carrots, grapes, and other healthy treats. Some days it really feels like you are not alone. That's when it's great to have a group of friends to rely on. Find your group. But make sure that you are close in the good times and the stressful times. There are many places to find support. You can contact your local disabilities chapter for a support group or you can check your church. Or it could be a Facebook group that you discovered. Make sure you share the highs and lows. Those highs make a huge difference in overcoming the struggles during the low times. They give you a place to look forward to. Yeah...you know what I mean. A new t-shirt, a new pair of leggings, those cozy looking warm socks. A new journal or even a new pen. Little things do mean a lot when you have the majority of your money going to your kids. So pamper yourself and get that little thing you have been eyeing. You'll find yourself feeling better every time you wear it or use it. What works for one person, doesn't work for everyone. Some might say exercise is not an option. But remember, exercise doesn't mean you need to run a marathon. It means to get up and walk. Get moving. Getting extra sunshine helps. Healthy eat helps. Find your support...because you are not alone. Taking it one moment at a time is doable and you will overcome the mountain on a daily basis. You just need to take care of yourself in the process. And I know this is the hardest thing to overcome....you are not being selfish in helping yourself. You are making yourself stronger for your children's sakes. 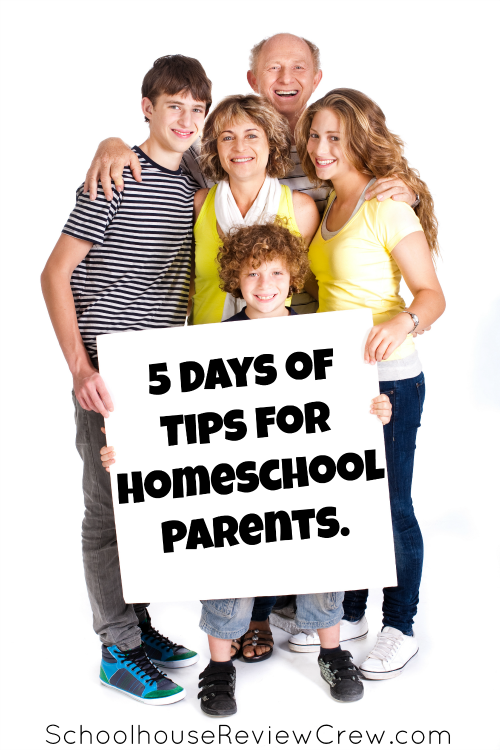 We are linking up many others from the Schoolhouse Review Crew on the 5 Days of Tips for Homeschool Parents Blog Hop.....Take some time to see what they have learned on their homeschooling journeys!